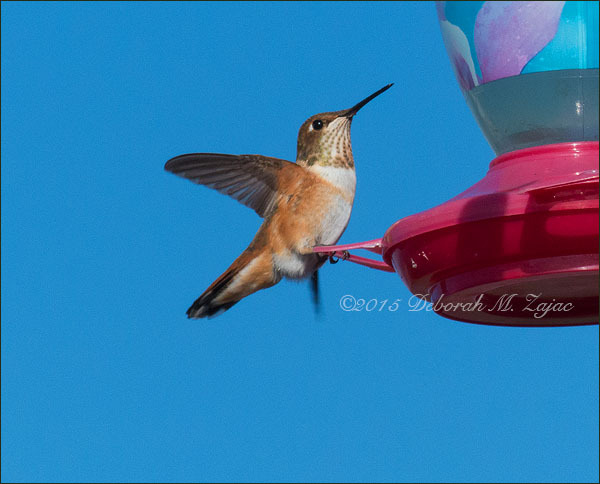 This is my first photograph and sighting of a Rufous Hummingbird! I’m still so excited about seeing this little Hummer. So, I’ve posted this image instead of a macro for this week’s Project 52 image. Instead of carrying my long lens I decided to take my Lumix FZ200 to use if any wildlife or birds came along. I’m sort of getting the hang of this Bridge Camera. I just need to use it more. I’m planning to take it on He-Man’s Birthday Cruise which is just around the corner! It will be easier packing, carrying it around, and I won’t need a tripod. Thank you Hui! How wonderful! You may have a chance to photograph them still before they leave for a warmer weather. Beautiful photograph :-). Great angle and clarity! Oo, first sightings are so exciting! I love it when they fly near my ears. The sound of their super-fast wings is so delightful. Me too! I love it when they zoom right in front of me and watch me for a moment or two when I’m taking my 10 minute sun bath each day. Beautiful shot of a lovely bird and congratulations on your first sighting!! They’re one of mine too! Thank you for the lovely comment.